Hello dear reader! This article on the T-72 Shafrah has not been updated since 19th March 2018, meaning that the article may be out of date, considering that the Syrian Civil War continues. The T-72 Shafrah was originally a testbed for a new type of armor made by the Republican Guard’s 105th Mechanized Brigade (first seen used on bulldozers in October 2016). This upgrade was supposed to resist all forms of anti-tank rockets. 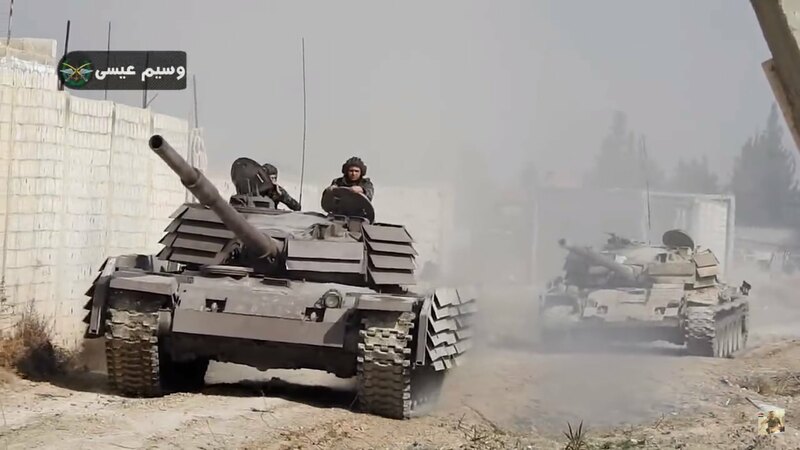 Throughout the Civil War, Syrian tanks have been highly vulnerable to RPGs (Rocket-Propelled Grenades) and Anti-Tank Guided Missiles (ATGMs), and successful missile attacks against SAA tanks in Damascus are often filmed and used for enemy propaganda. 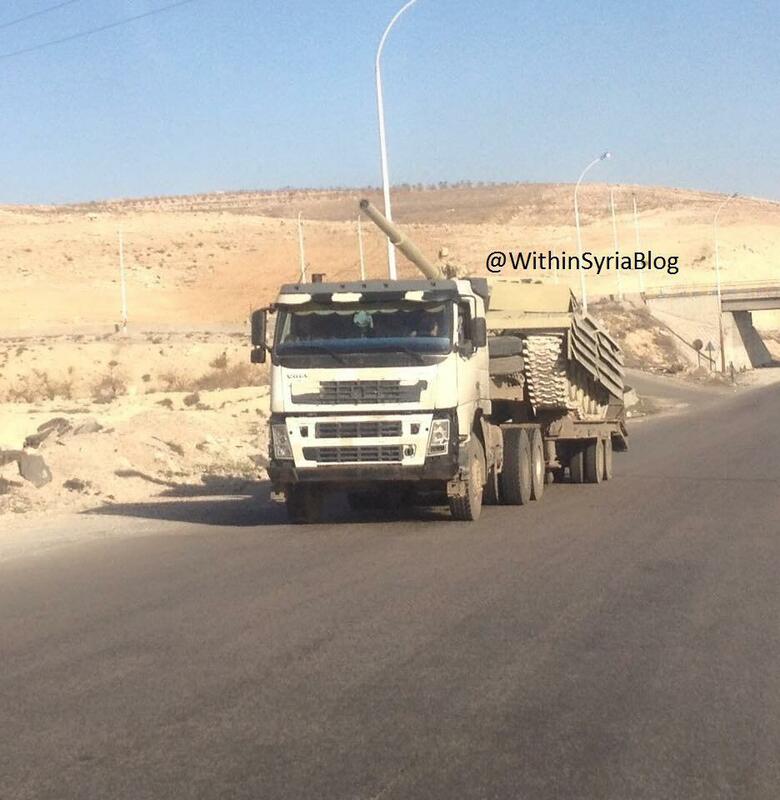 Initially, the Shafrah package did not appear to be sufficient for the SAA’s needs, but it seems as though more vehicles were upgraded to the Shafrah standard throughout 2017 and 2018, each bringing design improvements making the armor more resilient to missiles. Now, with anywhere between 11 and 17 T-72 Shafrah tanks, the package has a proven record of its success. 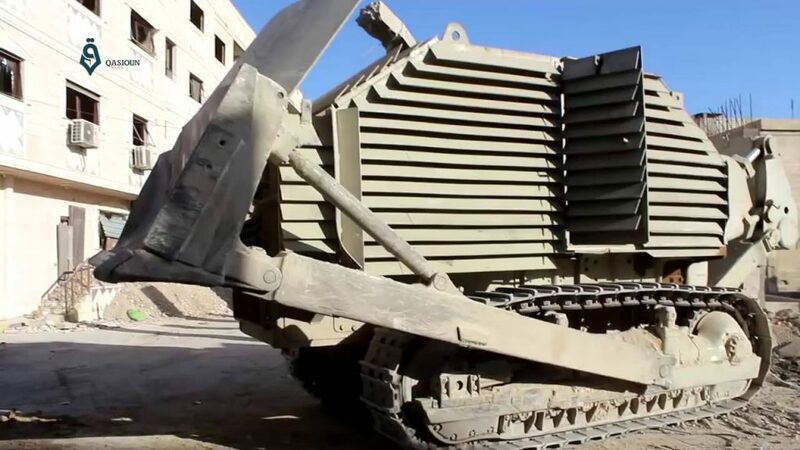 The name ‘Shafrah’ means ‘razor’, a joke originating from @withinsyria blog, referring to the armor looking like a shaving razor. This name has stuck with the tank and is apparently used in SAA propaganda. T-72 Shafrah I, posted online on 27th February 2017. 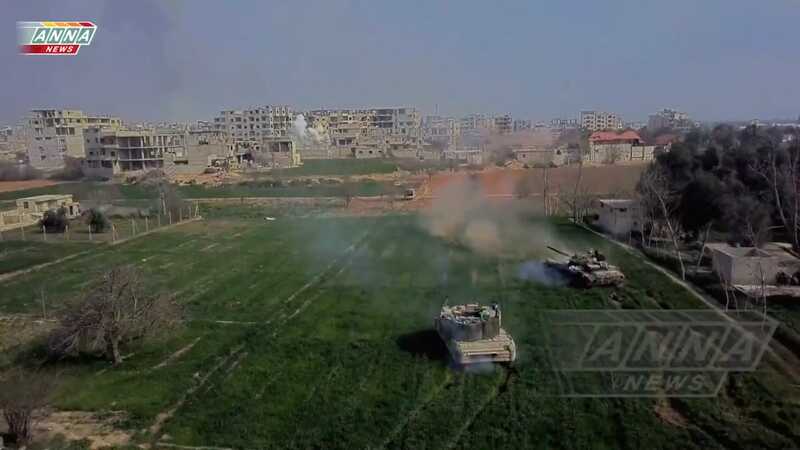 Whilst the T-72 Mahmia (also known as the T-72 Adra) upgrade of the SAA 4th Armored Division was successful at defeating RPG-29 hits, it was not consistent at defeating ATGMs. In late 2016 / early 2017, it seems as though tank upgrades were slowly being centralized by the Syrian Arab Army, with the intention of making a new type of upgraded T-72 that is invulnerable to all missile types. Around late 2016, a tweet from @syrianmilitary, referred to a mystery T-72 upgrade dubbed “T-72 Grendizer” (which refers to a popular Japanese cartoon show that was popular in the Middle East in the 1980s – children of that era now being the tank crews of today) and was suggested to be “the T-55 Enigma reborn”. The Shafrah may actually be this project. It has, in some sense, composite armor like the T-55 Enigma. The T-72 Shafrah’s armor is quite distinct. Essentially, numerous brackets are placed on the tank’s turret, which have a number of angled plates welded onto them. Some tanks have sideskirts (most appear to at least have sideskirt mounts consisting of two metal beams above road-wheels), which follow a similar pattern, but the welded plates are not angled. WithinSyria blog reported that the armor plates are made of RHA (1.5 mm – 2 mm thick), tungsten, and glassfiber. It is further rumored that the tungsten part refers to 1 mm thick tungsten copper plates. If this is true, then this armor package, therefore, seems as though it is designed to be a form of composite armor which, like the T-55 Enigma, should be able to stop ATGMs. However, with an alleged budget of $5,000-10,000 US per month, the Republican Guard is unlikely to be able to use tungsten on a wide scale due to the material being too costly. As such, it is equally valid to believe that the plates are made purely from steel until further evidence is available. SAA propaganda showing T-72 Shafrah III, probably not long after it was built, around June 19th 2017. The extent of the uparmoring can be seen clearly in this photo. Identifying each individual T-72 Shafrah tank has proven difficult due to a lack of sources available. The tanks are identified in this article by assigning them a designation based on their base vehicle (in this case, T-72 (Urals), and T-72AVs exclusively). T-72 Urals have a plain turret, but T-72AVs have ERA (Explosive Reactive Armor) bricks on the turret, making the two models distinct. The base designation is followed by a number denoting when they were first photographed (importantly, this does not necessarily mean that vehicles with lower numbers were built first). Separate vehicles are identified by comparing their Shafrah features – mostly armor layout schemes. This system has its flaws. For example, tanks may lose parts of the armor during the course of battles, or armor brackets might be replaced or removed entirely. Therefore, some tanks may appear differently at different points in time, meaning that they are mistaken for two separate vehicles. The upshot of this is that this article may overestimate the number of Shafrah vehicles in existence. Similarly, relying on only photographic evidence may mean that it underestimates the number because some Shafrah tanks may not have been photographed. 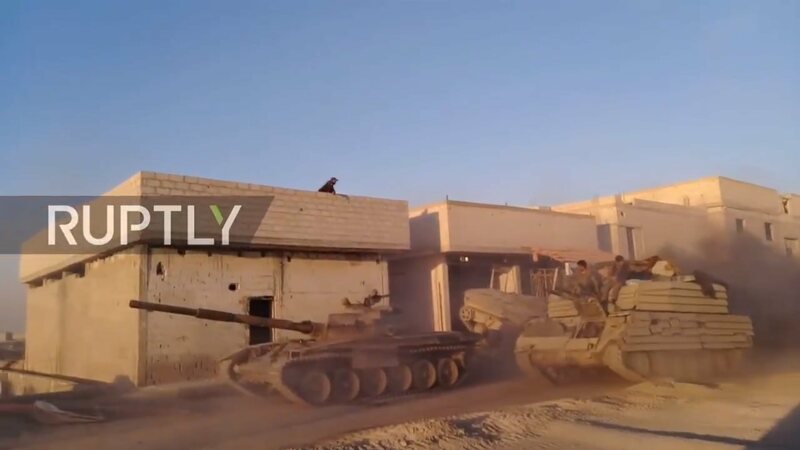 Also consider that photos sometimes surface months after being taken, thus making a chronological typology difficult (see T-72AV Shafrah VI for an example of this – photos taken on 3rd November 2017 only surfaced along with photos of the tank on 4th March 2018). T-72 Shafrah I has the fewest number of welded plates on its brackets – typically, two large plates. There is a single plate with no welded plates on the right of the gun (as if facing the vehicle). The vehicle was hit by an ATGM in Eastern Ghouta, on 27th February 2017. The turret ring was damaged and the driver was wounded, likely meaning that the brackets were repaired and/or replaced, which complicates identifying the tank. 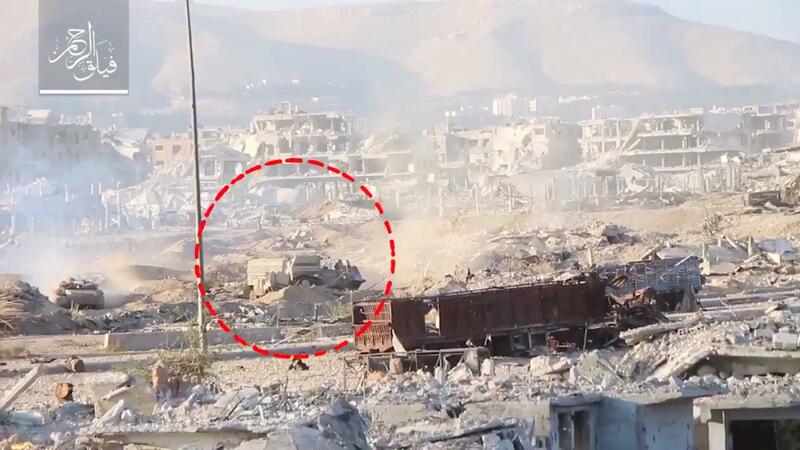 This tank originally had sideskirts, but these appear to have been eventually removed after 22nd March 2017, where it was believed to be seen at the Qaboun offensive (still with sideskirts on the 22nd however). (Again, identifying this particular tank has proved difficult due to both a lack of photos and the ATGM hit meaning the brackets were likely repaired. As such, it is possible that some photos believed to show the vehicle actually show different and separate Shafrah upgrades). 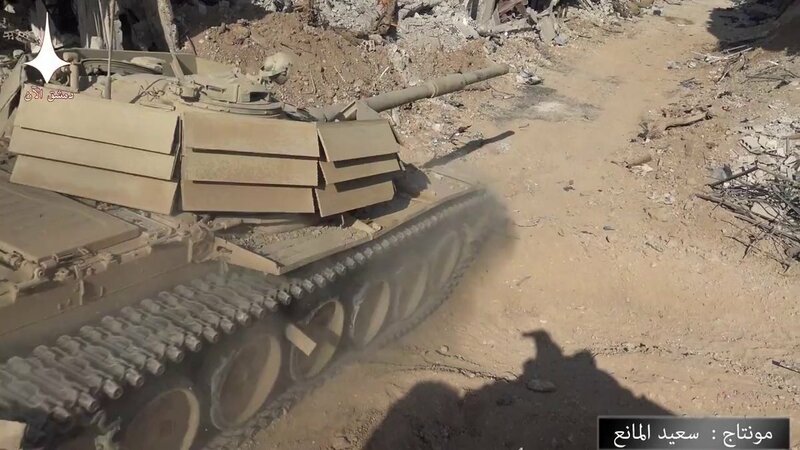 It is believed that this tank was also seen in Eastern Ghouta, circa 4th March 2018, having sustained significant combat wear and tear. The front spotlight has been shot out, and the turret plate right of the gun appears to have been replaced. T-72AV Shafrah I has no sideskirts, but does have two welded beams between its road-wheels to mount a sideskirt. The turret has seven or eight brackets, each with six or seven short plates welded on. The right side of the front bumper also appeared damaged and bent out of shape when seen at the Qaboun offensive on 22nd March 2017. That bumper section may likely be missing now. It is believed that it was this vehicle which was hit by an ATGM around 30th September 2017 at Hawsh Dawahirah. T-72AV Shafrah II has no sideskirts, but has the welded beams for their mounting. It also appears to have only four turret brackets, each with five or six welded plates. It has a single plate on the right side of the gun acting as the protective bracket in that area. It also has Viper 72 thermal sights (see sidenote III below). This tank was first seen on 25th March 2017, possibly at Qaboun, originally mistaken for T-72 Shafrah I. An unidentified T-72 Shafrah (whether Ural or AV is unclear) was knocked out on 16th April 2017 at Qaboun. 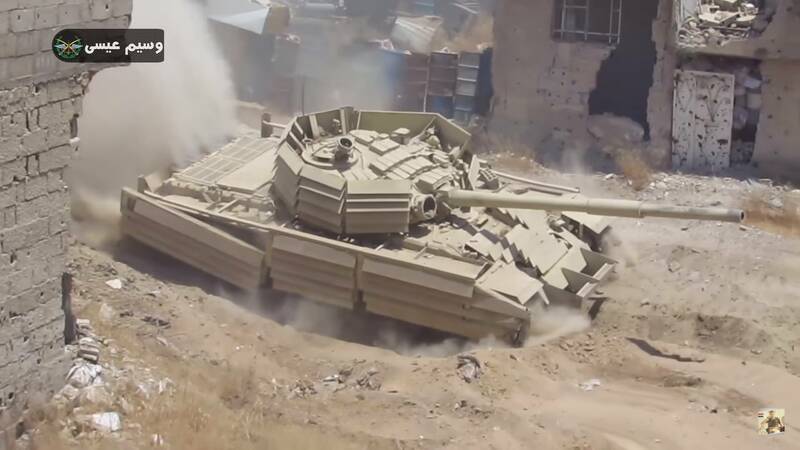 It was originally thought that this was T-72AV Shafrah II, but that tank was seen as late as July 2017. It appears to be missing some brackets and cannot be identified as a result. (See below for more). T-72 Shafrah II has no sideskirts, but the two welded beams for mounting them. It has seven turret brackets, six of which have three welded plates. The seventh, on the right of the main gun (as if facing), is made of two plates, with a section cut out to avoid the gunner’s optics / LRF being obstructed. 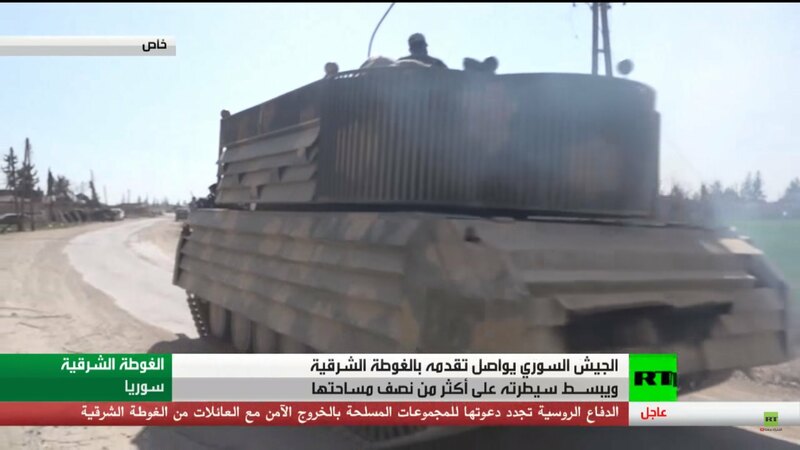 This tank was first seen at Qaboun on 6th May 2017. The front bumper was later mostly broken off. T-72 Shafrah III has sideskirts consisting of three brackets. The turret has roughly eight brackets, each with four welded plates, except the bracket on the right of the main gun, which has only two to avoid the gunner’s optics /LRF being obstructed. The tank was photographed before it saw any combat at all on 19th June 2017. An unidentified T-72AV Shafrah was seen at Ein Tarma, Qaboun, 21st June 2017. The tank has no sideskirts, and six turret brackets with four welded plates on each. The bracket on the right of the gun has only two plates. 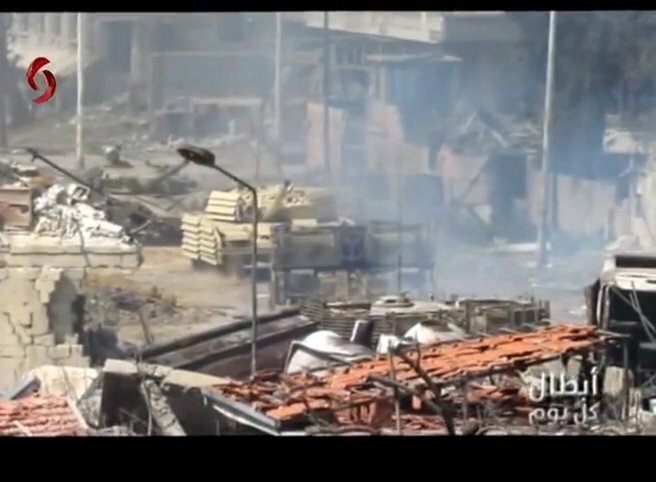 It is possible that this is the same Shafrah destroyed at Qaboun on 16th April 2017, but this photo of it (apparently in tact) was taken before that date, and only posted online in June 2017. This remains to be proven. 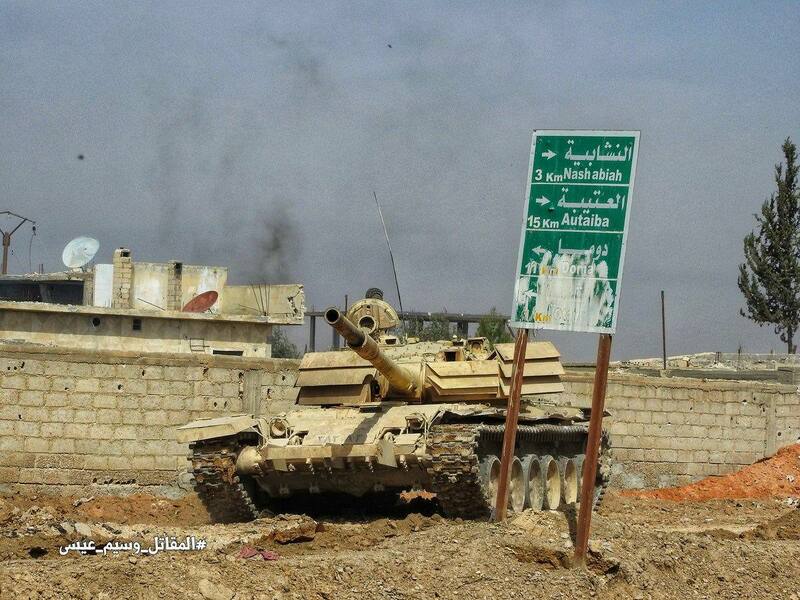 T-72AV Shafrah III has damaged sideskirts made of three brackets. The left side (facing) is missing the rear bracket, and the right side is missing the bracket. The turret has many brackets (seven to nine), each with five to seven welded plates, except the bracket on the right of the gun, which has only two, to avoid the gunner’s optics /LRF being obstructed. The tank was first seen on 19th November 2017, crossing a bridge over the River Euphrates via Hawijat Kati island at Deir ez-Zor. T-72 Shafrah IV is the most heavily armored Shafrah built so far. It has sideskirts split into three sections, with missile damage on the middle section of the left side (this section is likely to be replaced or repaired). The turret brackets strangely look as if they are made from one continuous bracket, rounded to fit the turret’s shape. The bracket has eight to ten sets of three welded plates (again, only two welded plates on the right of the gun to prevent obstruction to the gunner’s optics). The plates on the left of the gun have a small cut out so that the coaxial machine gun is not obstructed. This tank was first seen in Eastern Damascus, 7th January 2018, trying to reach Harasta vehicle base. 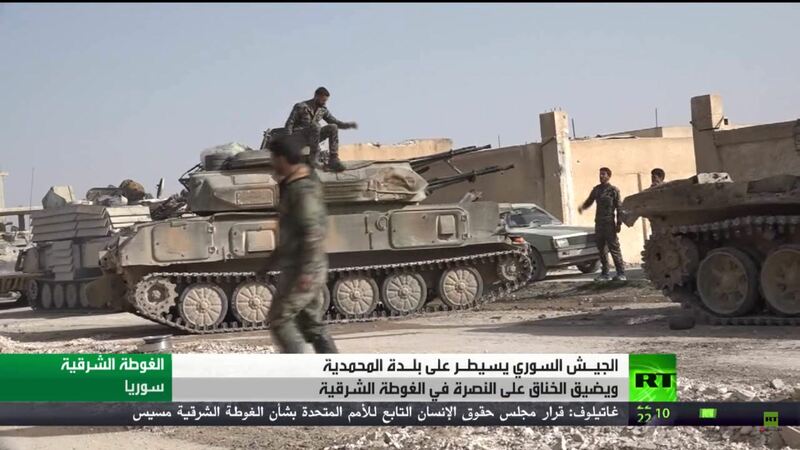 T-72AV Shafrah IV has no sideskirts, and no mounting bars for it between its roadwheels. Its turret has seven to nine brackets, each with four welded plates (the bottom welded plate is taller than the rest), and only two welded plates on the right of the gun. This tank was first seen at Eastern Ghouta, 3rd February 2018. 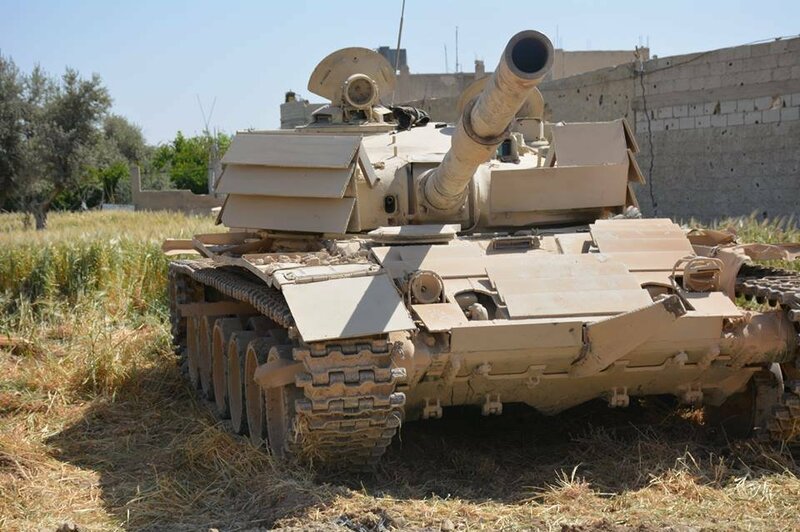 T-72 Shafrah V has a distinctive dark grey / brown colour. It has sideskirts, probably in three sections. The turret has eight brackets (the direct rear bracket is missing), each with four welded plates (again, except the bracket on the right, which has two plates). The tank was first seen around mid-February (a few days before the 19th, perhaps) preparing for the Eastern Ghouta offensive. T-72 Shafrah VI has no sideskirts and roughly five brackets making up the turret (leaving a large gap at the rear of the turret). The brackets all have three plates each, but the half-plate below the gunner’s optics has only two. The tank also has no uparmoring on the engine deck. 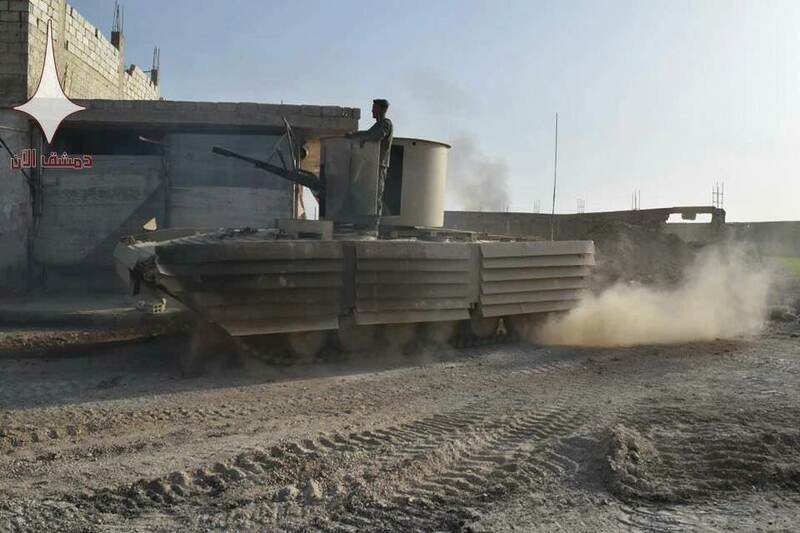 The tank was first seen around mid-February (a few days before the 19th, perhaps) preparing for the Eastern Ghouta offensive. T-72AV Shafrah V has sideskirts and seven turret brackets with four plates each making up the turret armor (with a single plate below the gunner’s optics, like T-72AV Shafrah II). The sideskirts are split into three sections, and the rearmost section on the tank’s right side appears to be falling off. It was first seen in a montage of footage from offensives at Qaboun, Ghouta, Ein Tarma and other areas on 26th February 2018. The vehicle was likely first put into action at a much earlier date, most likely late 2017. 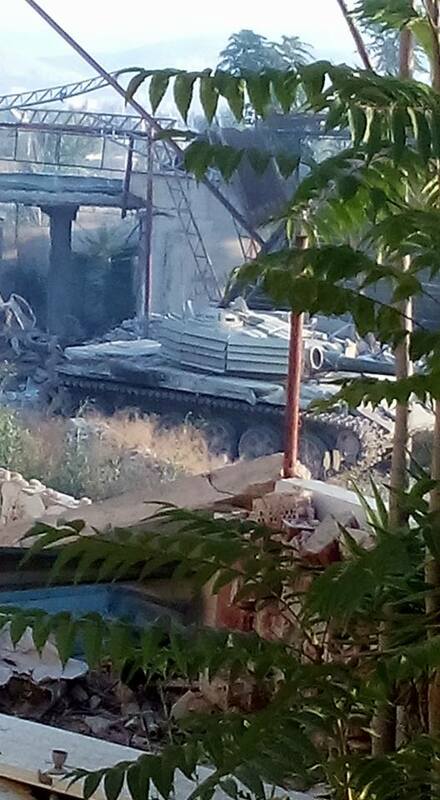 It is likely that it sustained damage in the Eastern Ghouta offensive in early March 2018, leading to a loss of its rear right sideskirt section, and a rear turret bracket section, but the photo showing this cannot be confirmed to be T-72AV Shafrah V with certainty. T-72AV Shafrah VI originally had sideskirts (see photos from 3rd November 2017 at Ein Tarma) but when photographed on March 4th, 2018, it does not have sideskirts. The turret is likely made up of seven brackets (a rear one is missing) with only several plates on each. Unlike most recent Shafrah tanks, it has several plates below the gunner’s sight which are tightly spaced, and are also shaped like trapeziums. There is also a cutout section on the left of the main gun for the turret machine gun to remain unobstructed. Photos from 4th March 2018 show that the right mudguard is missing, and the front bumper has snapped off in front of both tracks. The tank also has a registration plate painted on in black on the lowest hull Shafrah plate: ٣٨٣٠٨٣, and on the lower glacis plate in sand-yellow. The tank is also an AV, but strangely has no ERA on the turret, but the bolts where the bricks were are still there. The vehicle was first photographed on 3rd November 2017. It was later sighted at the liberation of Beit Nayem, Eastern Ghouta on 4th March 2018. T-72 Shafrah VII (unclear model – this will be updated when known for certain) has no sideskirts (interestingly, the remains original mudguard sections are mangled out of shape), and has an estimated seven to nine squat turret brackets, each with three Shafrah plates, except on the right of the gun, which has two. A distinguishing feature is the narrow turret bracket on the left of the gun. The tank may also not have any rear uparmoring. It was first seen at the town of al-Muhamadyia on 7th March 2018. 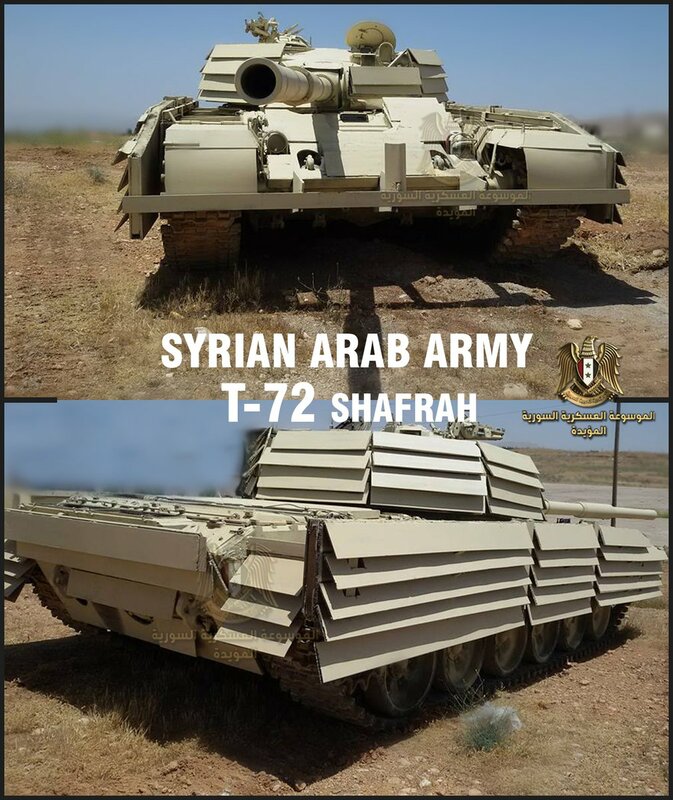 Accounting for the potential errors with this methodology, and that there may also be unseen Shafrah tanks, there are an estimated 11-17 Shafrahs that have ever existed, probably 16 (thirteen known tanks, plus two unidentified tanks, plus the possibility that photos thought to show T-72 Shafrah I actually show two separate tanks). T-72 Shafrah I was first documented in combat in Eastern Ghouta, on 27th February 2017. The footage below shows that the vehicle was hit by an ATGM. As a result, the driver was wounded and the turret was damaged, but the vehicle was not destroyed. Crucially, there was no internal fire, which was a common problem with the T-72 Mahmia. T-72 Shafrah I being hit by an ATGM. The footage is cropped, and the vehicle was not destroyed. It was later photographed being transported back to the workshop on the back of a lorry. The photograph was dated 1st March 2017. 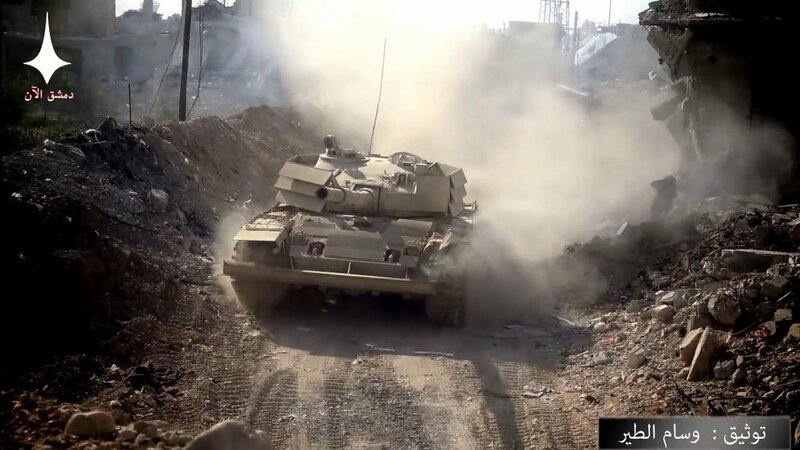 The T-72 Shafrah tank was next seen in combat along with the T-72AV Shafrah, and a third, lightly modified T-72 on 22nd March 2017 at Qaboun, in the north of Jobar, in east Damascus. The fighting took place near a fabric factory. The source (a tweet with two videos) suggests that 150 rebels were killed in the assault, which was supported by infantry. T-72 Shafrah I in combat at Qaboun, Jobar, Eastern Damascus, March 22nd, 2017. T-72AV Shafrah I in combat at Qaboun, Jobar, Eastern Damascus, March 22nd, 2017. On the 16th April 2017, a photo was posted online showing an unknown T-72 Shafrah having been knocked out at Qaboun. The photo shows the vehicle’s turret on fire, with multiple armor brackets missing. Reports suggest that it was hit by an AT mine which destroyed a track, but caused no damage. The crew escaped, but several soldiers are reported to have been killed or wounded in the attack. The vehicle was finally set on fire by the rebels, to stop any chance of recovery, and it is now probably wrecked beyond repair. Ahrah al-Sham have claimed responsibility for the vehicle’s destruction. 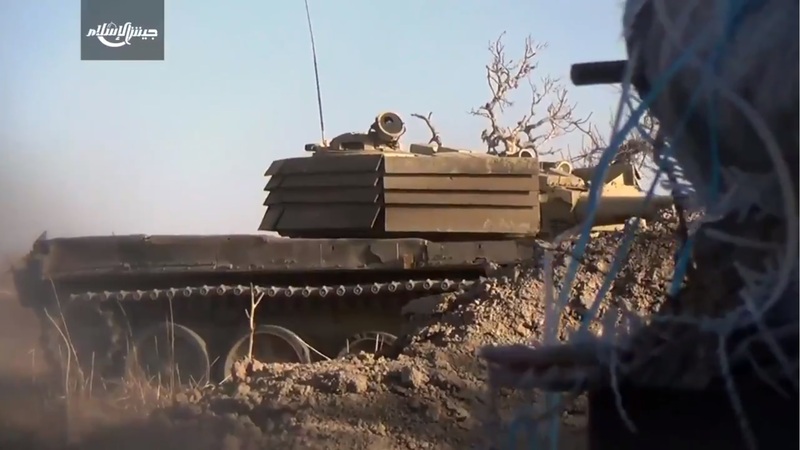 It was initially believed that this was T-72AV Shafrah I or II, but these tanks have been seen operational after April 2017. 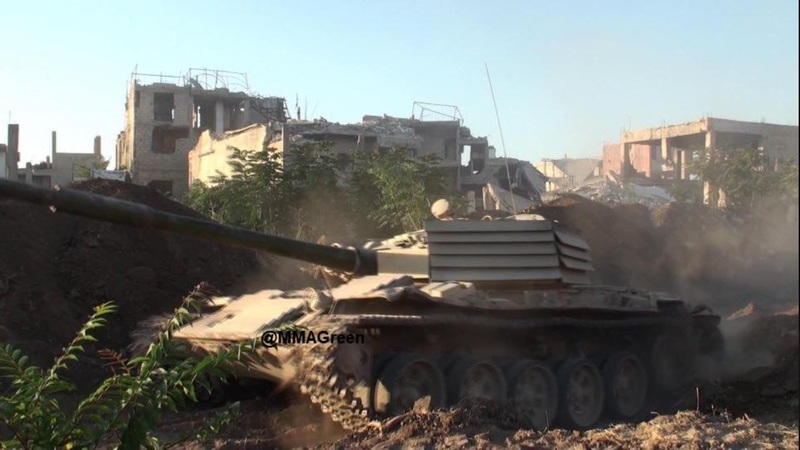 A T-72 Mahmia was alongside the unknown Shafrah during the attack. The T-72 Mahmia took an RPG-29 hit, which did not penetrate the tank. However, the commander sustained significant injuries. The unknown T-72 Shafrah, destroyed by rebels at Qaboun, 16th April 2017. Rebel footage after the tank was set alight. 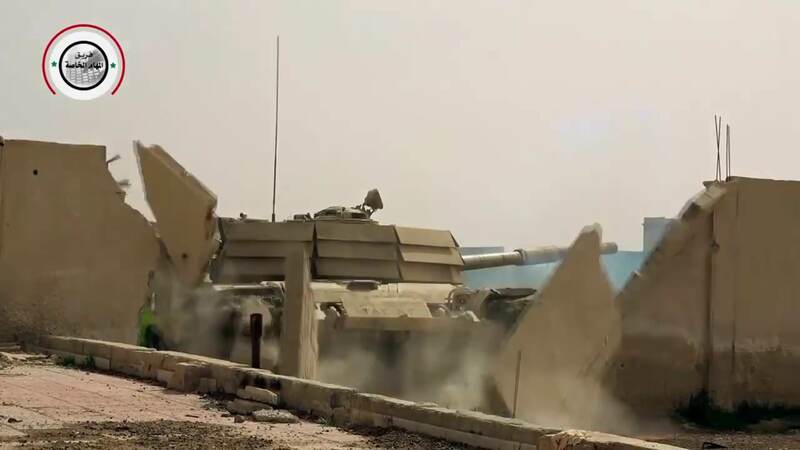 In an offensive that lasted from 18th February to 29th May, T-72 Shafrah II was photographed fighting again on the 6th and 8th May, and had likely been fighting throughout the offensive from mid-March. 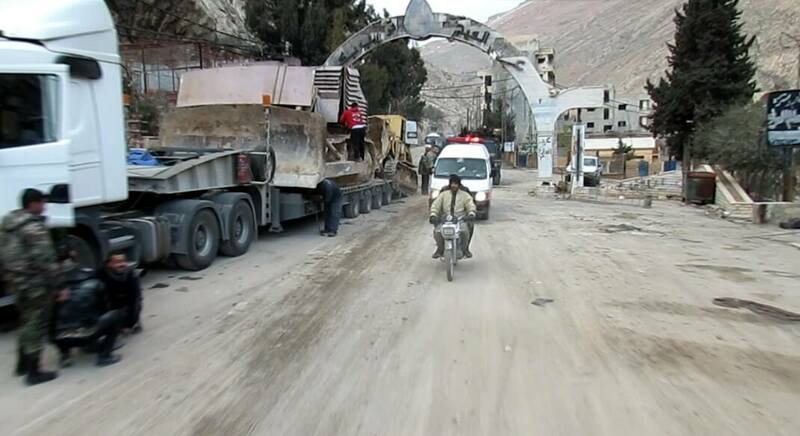 On May 7th, an agreement between rebel forces and Government forces led to the eventual evacuation of rebels from the district. Evacuations took place until 13th May, by which time the government had captured all of Qaboun. A new evacuation deal led to further rebels and their families leaving the district, and by May 15th, the government had total control over the district. T-72 Shafrah II at Qaboun, 6th May, 2017. Video of T-72 Shafrah II at Qaboun, 6th May, 2017. 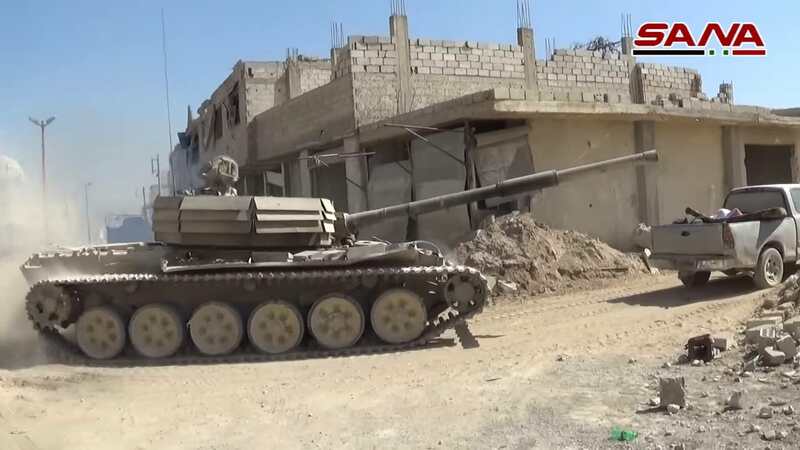 T-72AV Shafrah II was photographed in late June fighting in Jobar along with a ZSU-23-4 Shafrah, and at least one other regular T-72. 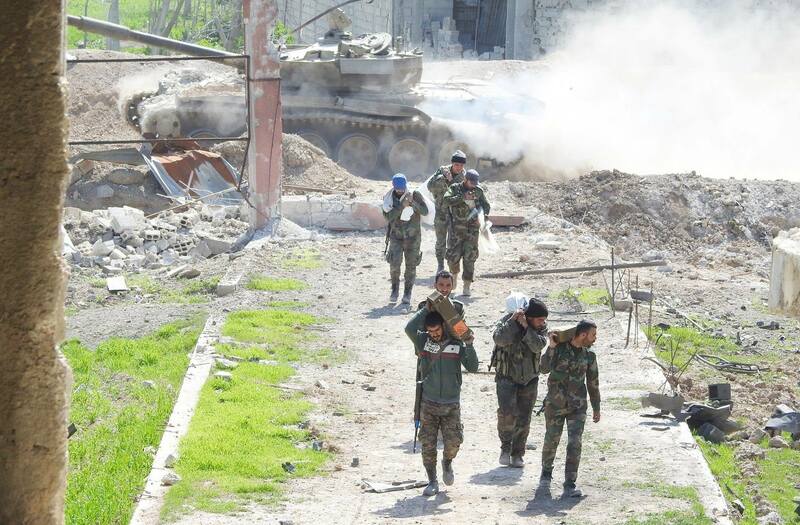 Reports indicate that the 105th Republican Guards were attacking Ein Tarma (near Jobar) from the southwest and made some gains. T-72AV Shafrah II, Jobar, 21st June, 2017. Footage dating to around late September 2017 shows what appears to be T-72AV Shafrah I being hit by an ATGM fired by Jaish al-Islam at Hawsh Dawahira. The vehicle likely survived the hit, as it can be seen driving backwards for a few frames before the camera cuts to another scene. 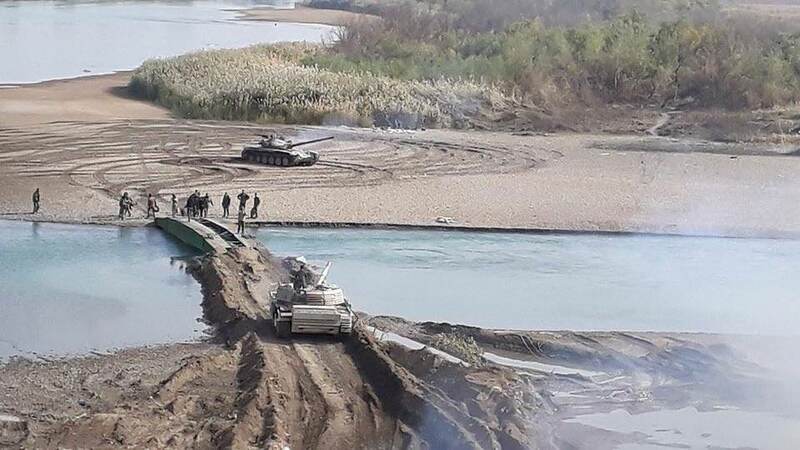 On 19th November 2017, four photos were posted online of T-72AV Shafrah III and other armor crossing a bridge over the River Euphrates via Hawijat Kati island at Deir ez-Zor. T-72AV Shafrah III behind a T-72AV near a bridge crossing at Deir ez-Zor (circa 16th November 2017). The rear third of the skirt (on the left) is actually missing from the tank. Notice also that the turret also has more brackets, and each bracket has more armor plates compared to earlier Shafrah-upgraded T-72s. This is likely in response to earlier models being too poorly armored. Rebels of Jaish al-Islam filmed T-72AV Shafrah IV up close around 3rd February 2018 at Eastern Ghouta. The rebels do not appear to have any AT weapons, hence they merely shot at the vehicle’s optics. The rebels were later forced to retreat due to their lack of AT weapons. Compilation SAA propaganda footage shows T-72 Shafrah V and VI preparing for the Eastern Ghouta offensive circa mid-February 2018 (probably around the 16th-19th). The video shows a column of vehicles including a T-72M1, a handful of BMP-1s, and two ZSU-23-4s preparing for or beginning an assault in Eastern Ghouta. 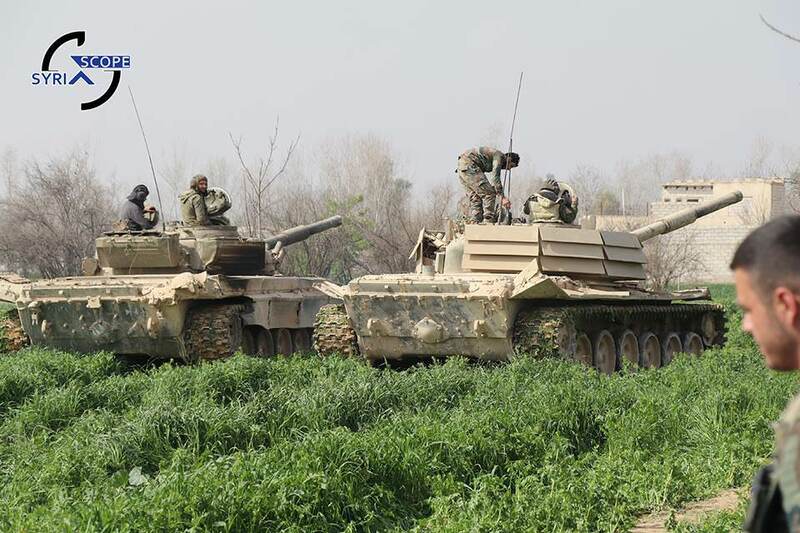 Front: T-72 Shafrah V. Rear: T-72 Shafrah VI. Eastern Ghouta, circa mid-February 2018. Front: T-72 Shafrah VI, with two turret brackets missing covering the rear. Note that the rear engine deck of the tank is not uparmored. 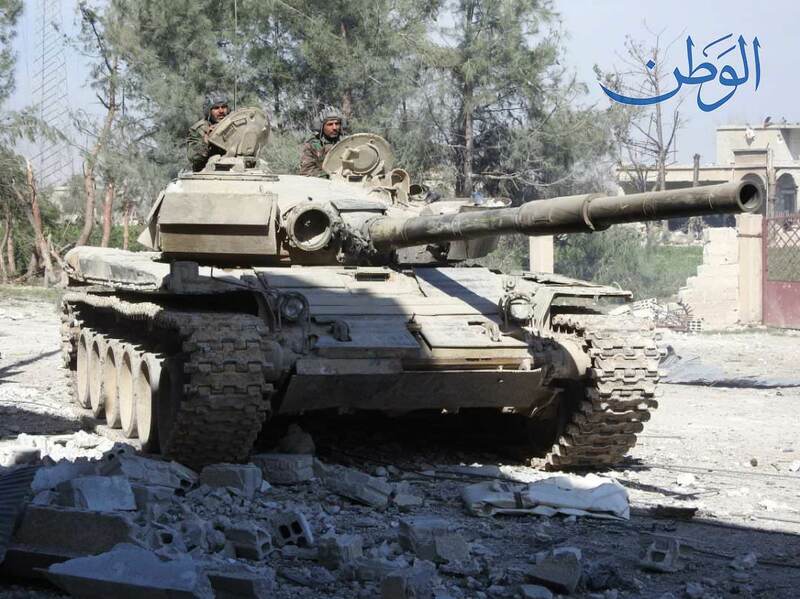 Background: T-72 Shafrah V, showing it to be missing a single turret bracket. Eastern Ghouta, circa mid-February 2018. 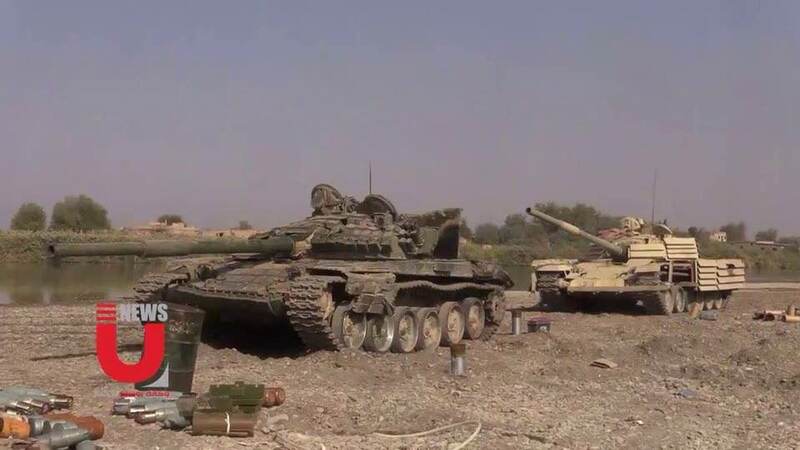 T-72 Shafrah V (left) and a T-72M1 with an improvised turret bracket (right). Eastern Ghouta, circa mid-February 2018. SAA propaganda footage of T-72 Shafrah V and T-72 Shafrah VI as part of a column in Eastern Ghouta, circa mid-February 2018. 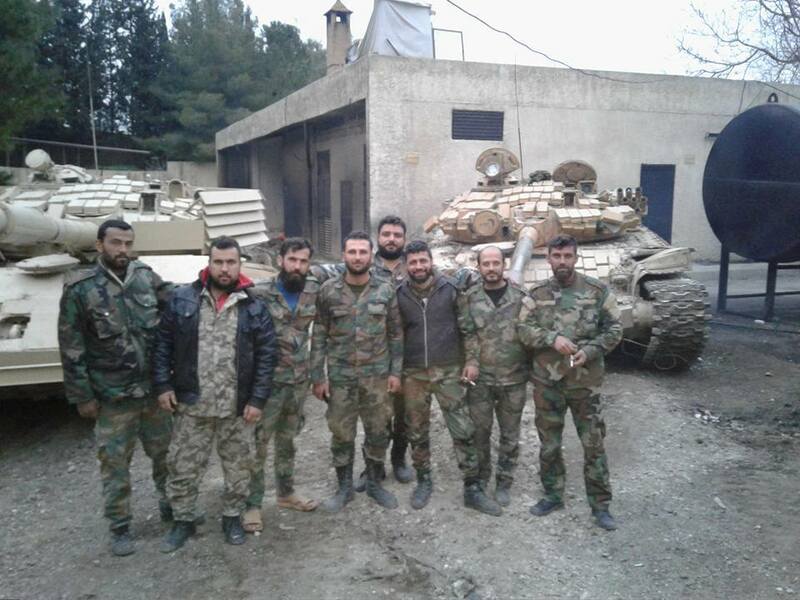 T-72AV Shafrah VI was photographed after fighting in Beit Nayem, as part of the SAA’s major Eastern Ghouta offensive, along with other T-72s (one of which is an AV featuring an improvised turret cage). An estimated twenty rebels were killed in the attack on the village, and others are reported to have fled. 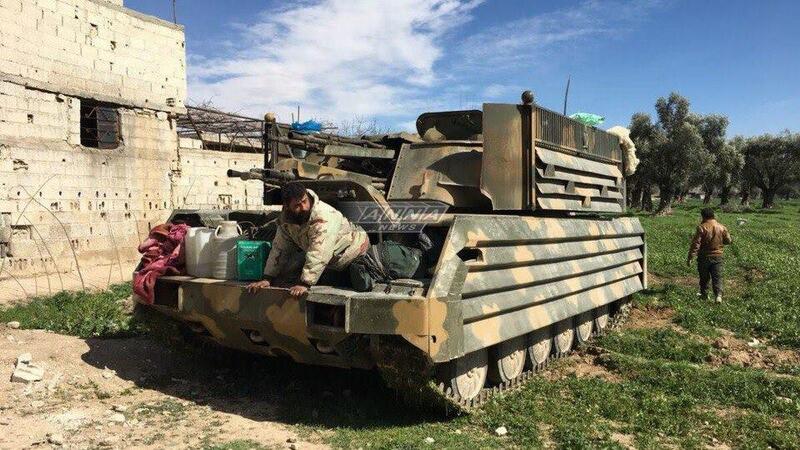 Another vehicle, a BMP-1 with a ZU-23-2 enclosed in an improvised superstructure was also photographed, which also features Shafrah-style sideskirts. 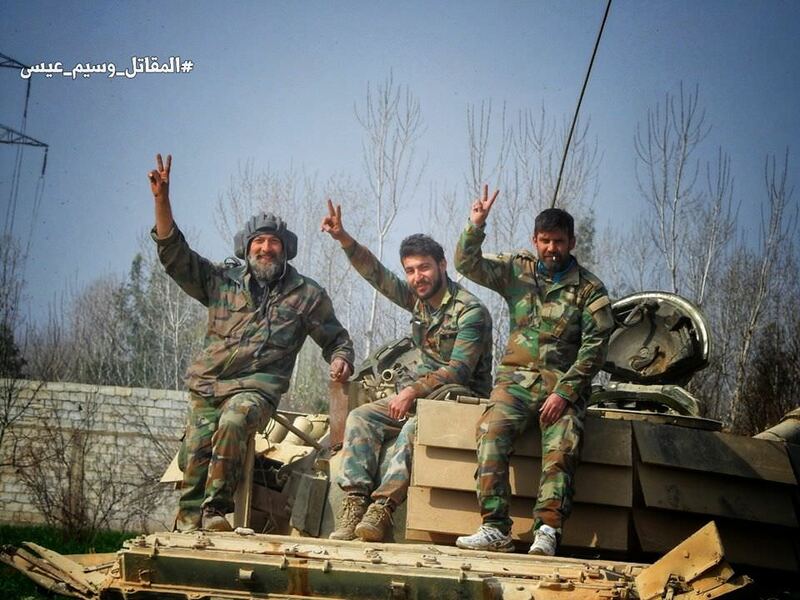 T-72AV Shafrah VI after the liberation of Beit Nayem, 4th March 2018. 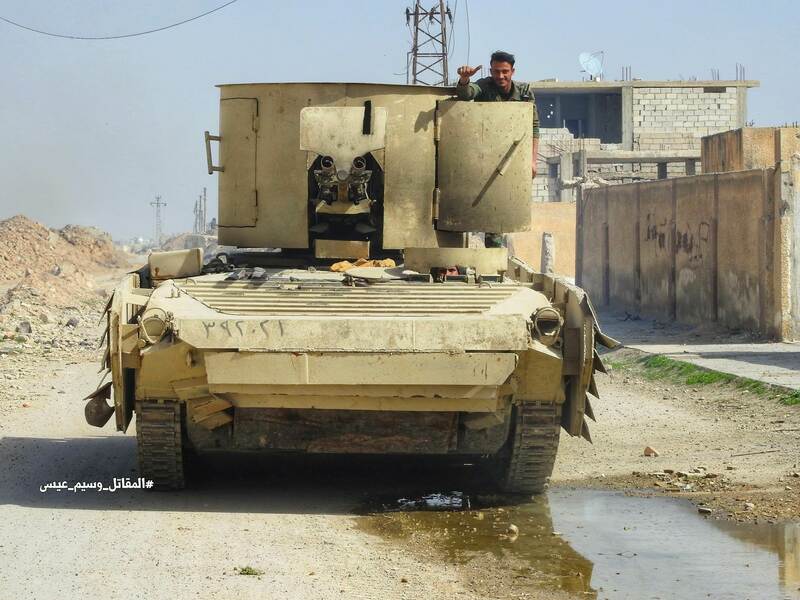 BMP-1 with a ZU-23-2 enclosed in an improvised superstructure also featuring Shafrah-style sideskirts. The addition of a ZU-23-2 is a common enough feature, but the Shafrah sideskirts appears to be fairly new. 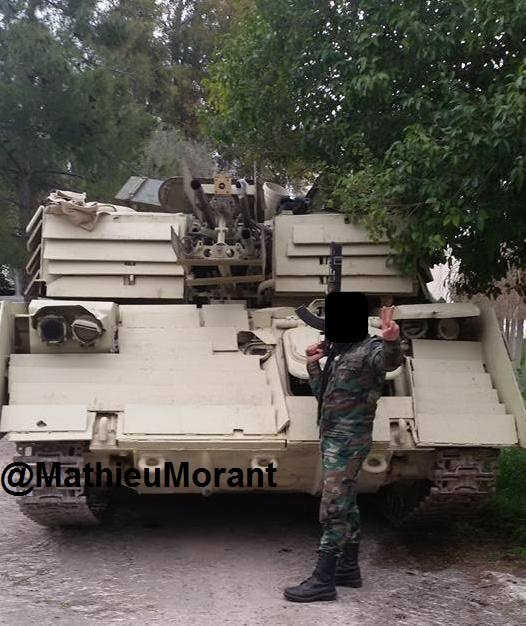 Previous BMP-1/ZU-23-2 conversions have notably featured sideskirts made from thin metal cages. The turret superstructure is also a significant improvement on previous designs. 4th March 2018, Beit Nayem. Different view of the above. Note the Shafrah armor on the front of the vehicle, and additional visor for the driver. 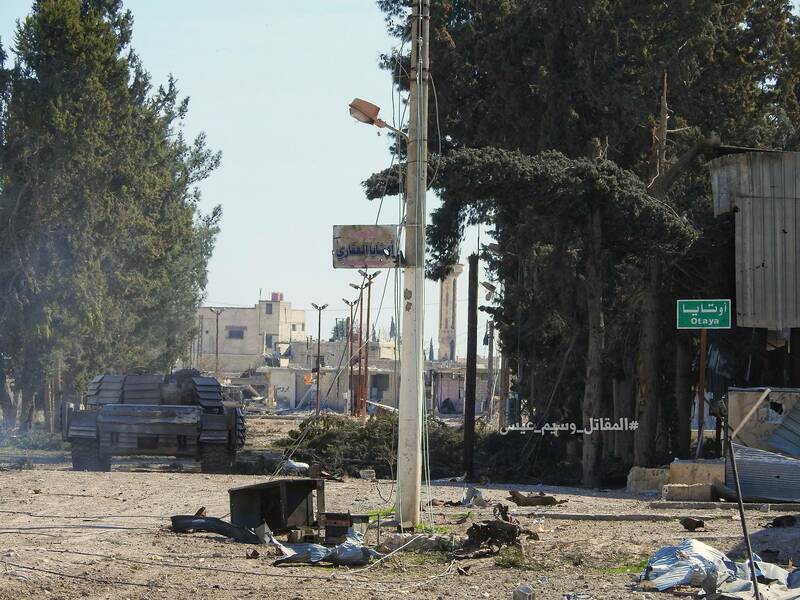 On 6th March 2018, one photo taken at Beit Nayem also shows that T-72 Shafrah III and T-72 Shafrah I were present at least after the village’s liberation. T-72 Shafrah III (background left, the second tank from the right. The four plates on the left-side turret bracket indicate it to be T-72 Shafrah III) and T-72 Shafrah I (in the center, covered by the soldiers. The single plate on the bracket behind the man furthest left is the indicator), Beit Nayem, circa 6th March 2018. 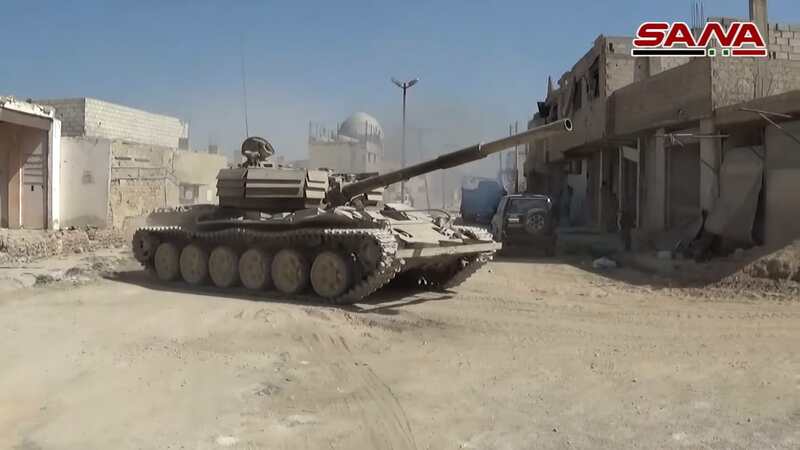 T-72 Shafrah VII was seen at the town of al-Muhamadyia on 7th March 2018 along with a BMP-1 during scant shelling operations. T-72AV Shafrah VI was shown by RT Arabic on 8th March 2018 to be continuing to advance in Eastern Ghouta, having presumably moved on from Beit Nayem village. This still reveals that T-72AV Shafrah VI not only is missing a rear turret bracket, but also has no ERA bricks. al-Muhamadyia, Eastern Ghouta, circa 8th March 2018. Credit: RT Arabic. T-72 Shafrah I in Eastern Ghouta, 8th March 2018. T-72AV Shafrah VI bursting through a wall, Eastern Ghouta, circa 9th March 2018. 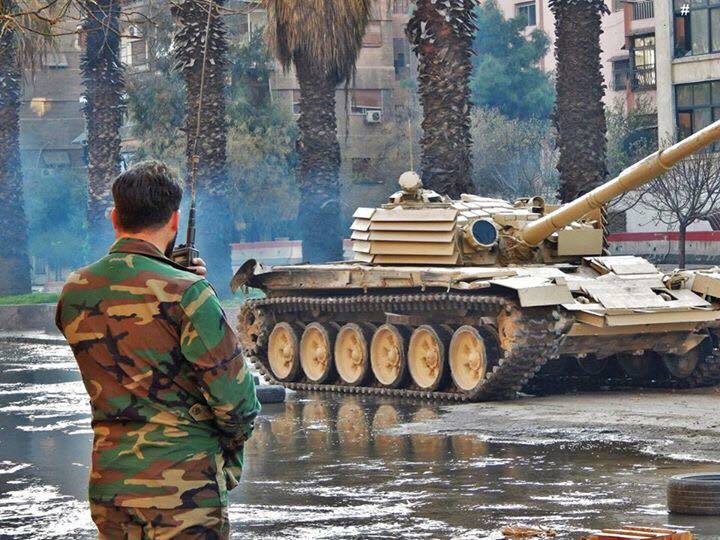 T-72AV Shafrah VI at Mesraba, circa 10th March 2018. T-72AV Shafrah VI at Jisreen, having travelled south from Mesraba, 10th March 2018. 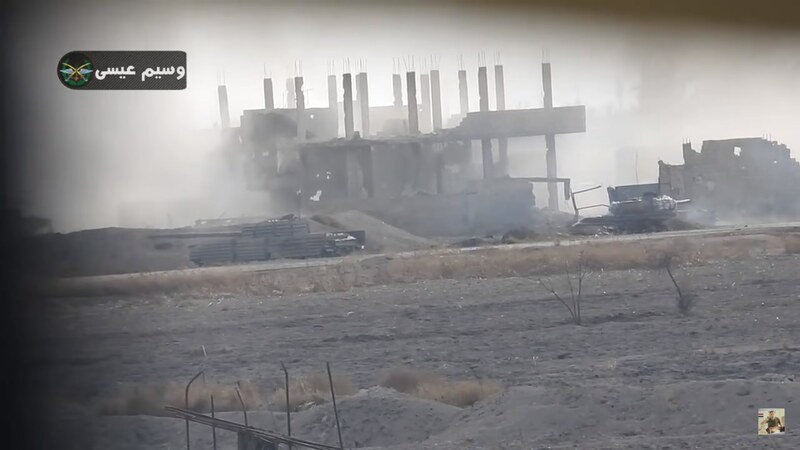 T-72AV Shafrah VI was seen circa 11th March 2018 attacking at the farmlands near Jisreen. T-72AV Shafrah VI at Kafr Batna, 19th March 2018. 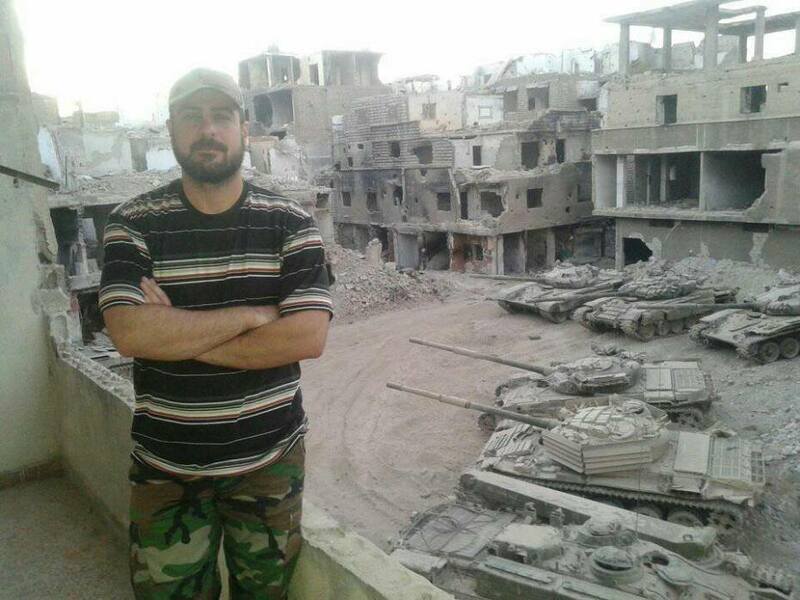 T-72AV Shafrah II at Qaboun(? ), 24th March, 2017. T-72AV of the Republican Guard, for comparison. 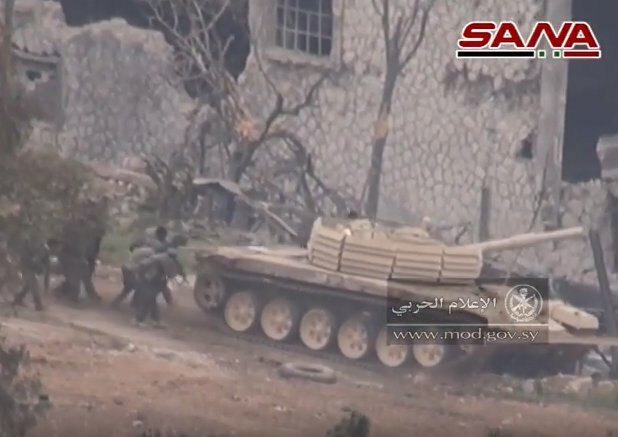 T-72AV Shafrah I in combat at Qaboun, supported by infantry, reportedly on 24th March 2017. 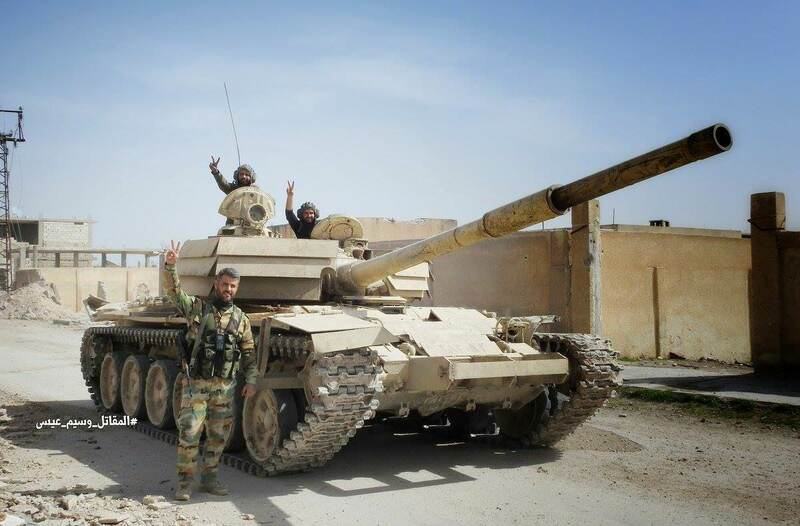 T-72AV Shafrah II on 25th March 2017. Bars originally holding on the sideskirts can be seen just in front of the first wheel and between the second and third from the front. Rows of angled armor plates can also be seen on the hull. 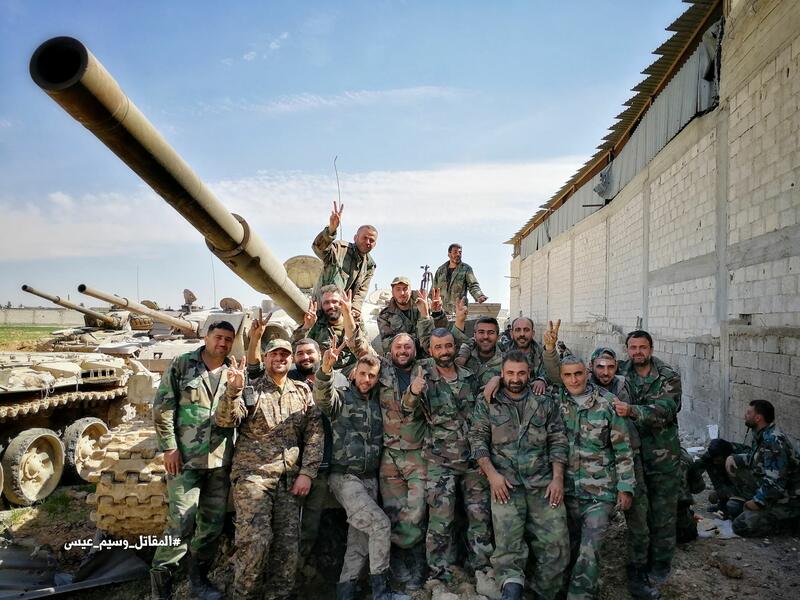 T-72AV Shafrah II and a T-72AV with their crews, 23rd March 2017. T-72AV Shafrah II and other vehicles. Unknown date. T-72 Shafrah I. Posted online, 1st April 2017, meaning this is its post-repair state. 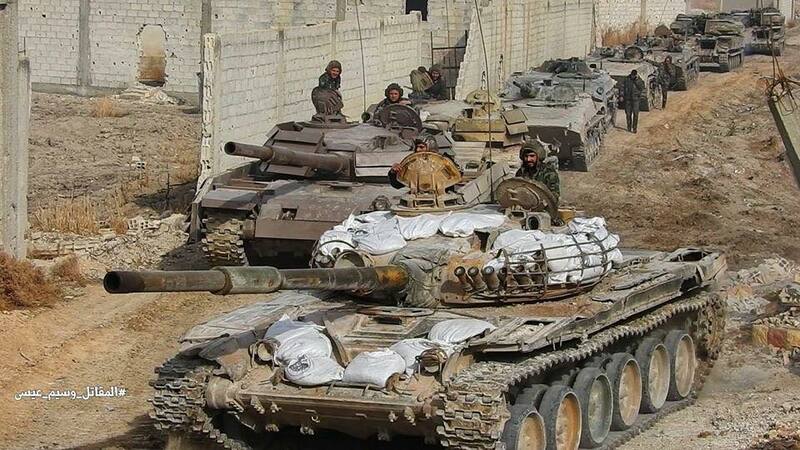 T-72 Shafrah V, in its distinctive brown / grey colour, and T-72 Shafrah VI. Circa mid-February 2018. A still from up-close footage of T-72AV Shafrah IV, taken by rebels of Jaish al-Isla at Eastern Ghouta, 3rd February 2018. T-72 Shafrah IV Eastern Damascus, circa 7th January 2018, trying to reach Harasta vehicle base. A black hole in the middle of the side skirt is likely an ATGM hit that did not penetrate the armor. There may also be an RPG hit to the turret, as indicated by a black burn mark. T-72AV Shafrah III behind a T-72AV near a bridge crossing at Deir ez-Zor (circa 16th November 2017), showing the other skirt to be missing its front third. Different view of the above, showing the rear of the tank to also be significantly uparmored. The SAA crossed the River Euphrates via Hawijat Kati Island. T-72AV Shafrah V. Still taken from a montage of SAA ‘archive footage’ posted online on 24th February 2018, as propaganda for the Eastern Ghouta offensive. 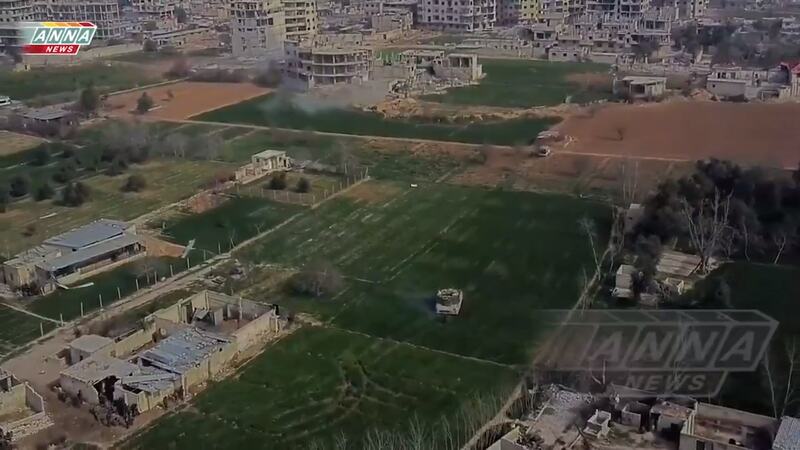 T-72AV Shafrah V. Still taken from a montage of SAA ‘archive footage’ posted online on 24th February 2018, as propaganda for the Eastern Ghouta offensive. The damaged sideskirt is a particularly useful identification method of this tank. 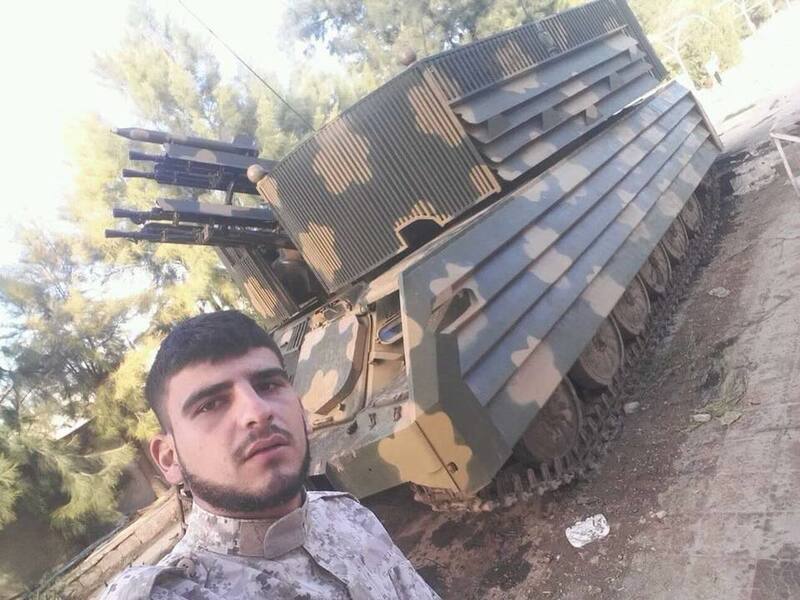 Unidentified T-72AV Shafrah. 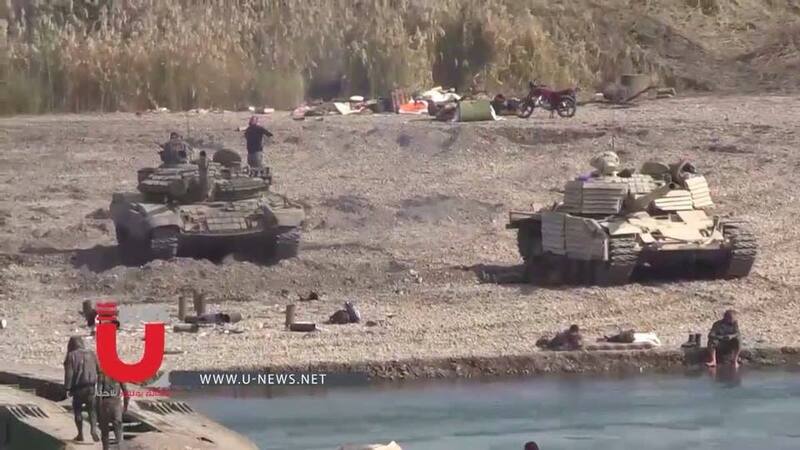 Behind is a T-72M1, and in front is a ZSU-23-4 Mahmia, and a T-72 Mahmia. Unknown date, probably Qaboun, late April / early May 2017. This may be T-72AV Shafrah II, but no other photos of that tank show it to have sideskirts, and an in-tact front bumper. 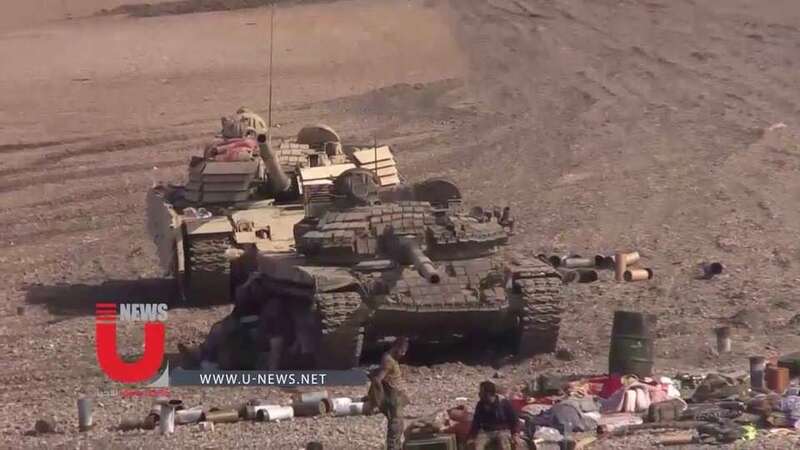 The tank is unidentified because its technical features are not totally clear enough to confirm it to be a new T-72AV Shafrah, and the images lack any confirmed dates to make this more difficult. T-72AV Shafrah VI at Ein Tarma, 3rd November 2017. In this photo, it has sideskirts, but photos from March 4th 2018 show that they have been removed. 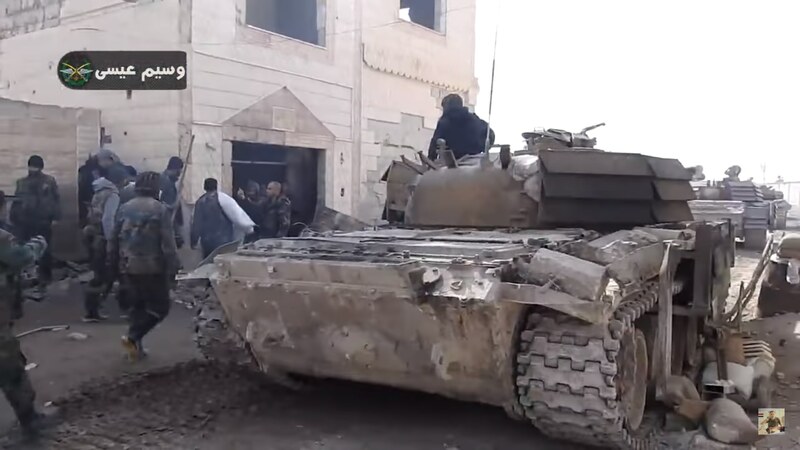 What is believed to be T-72 Shafrah I in Eastern Ghouta, circa 4th March 2018, having suffered significant combat wear and tear. Unknown T-72 Shafrah, circa 3rd March 2018, Otaya, Eastern Ghouta. 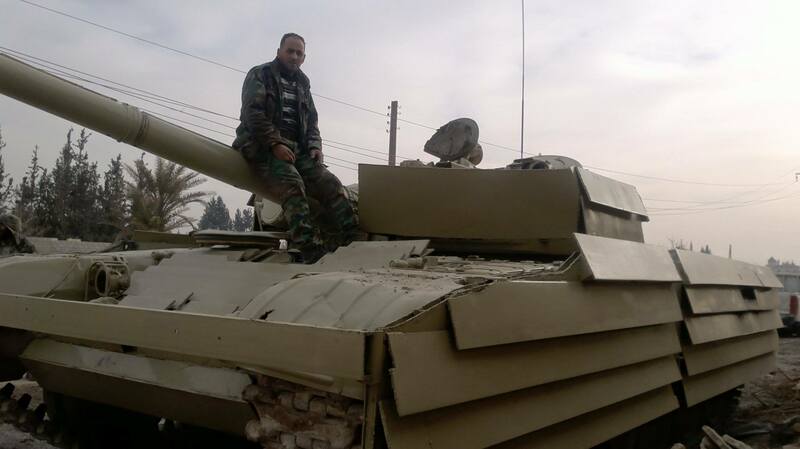 The tank is almost certainly T-72AV Shafrah V, but a lack of photos make it hard to confirm. 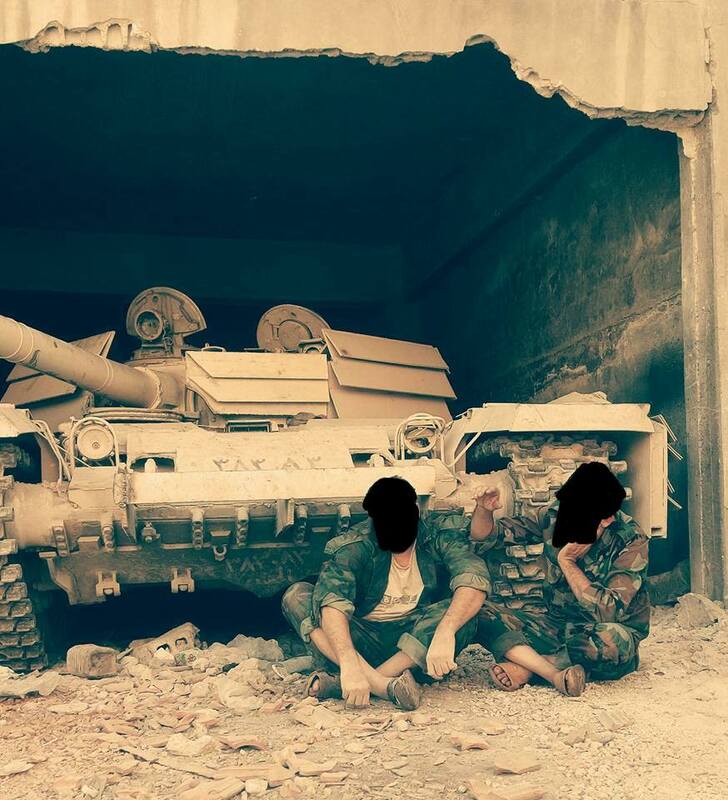 If it is T-72AV Shafrah V, then this photo indicates that the right rear sideskirt section has fallen off (it was previously hanging loose on one mount), and a bracket at the rear of the turret has fallen off or been removed (as with T-72AV Shafrah III). 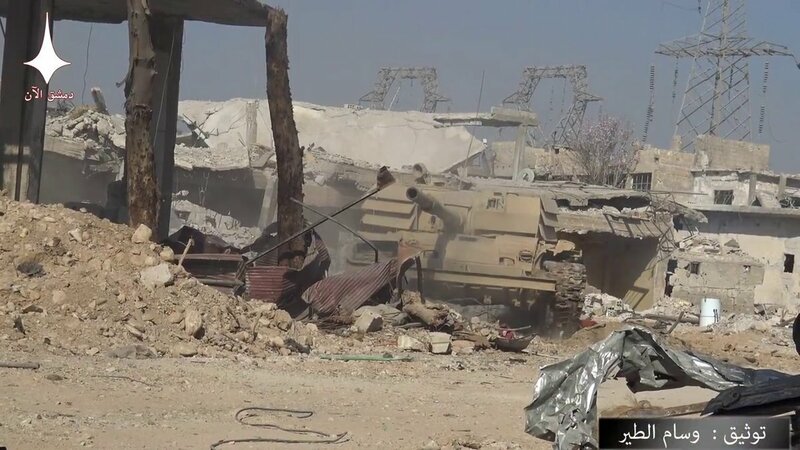 This photo showing T-72AV Shafrah V after combat damage makes sense, as it is clear from the dirt on the tank that it has seen significant combat. 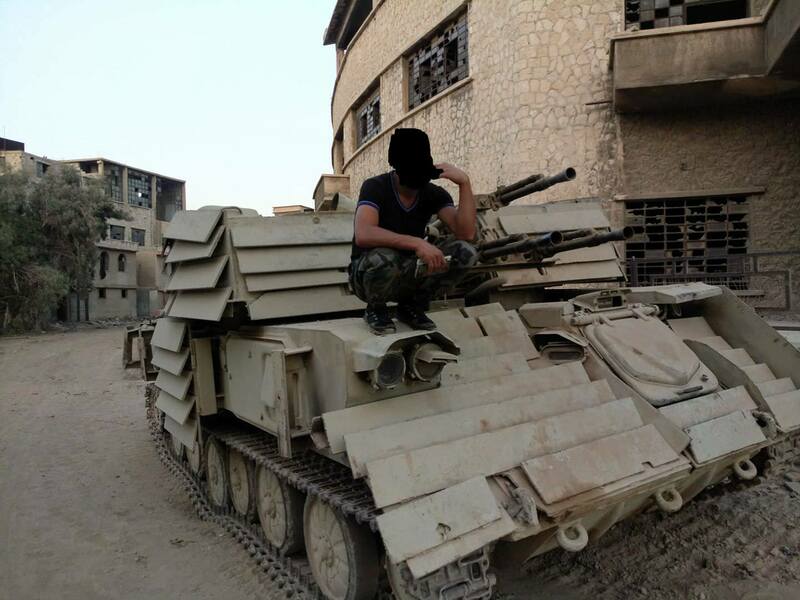 So far, at least two ZSU-23-4 ‘Shilka’ tanks have been upgraded with Shafrah armor, in various configurations. The first is similar to the regular Shafrah upgrade, but another (dubbed the ‘Shilka Super Shafrah’) deviates from the standard Shafrah design). ZSU-23-4s are actually used for supporting vehicles in urban combat, as their guns can hit enemy positions which are high up in tall buildings. Therefore, the tanks need to also be protected from ATGMs and rockets. A Syrian tank crewman reports that there are locally-built munitions for the Shilka which copies a Russian design, and that such munitions are plentiful. Furthermore, he reports that these munitions are so strong, there are even rumours that a single round has been known to demolish concrete walls. Rebels fear the Shilka due to its massive firepower, stopping power, and fairly good protection. 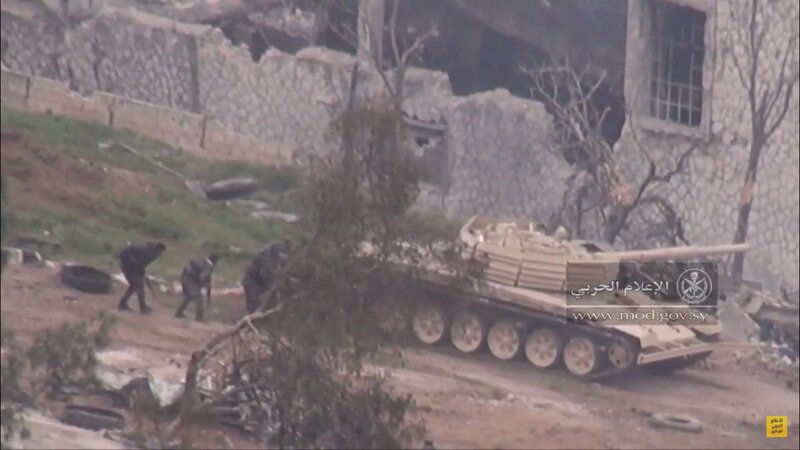 On March 26th, footage showing Shilka Shafrah I was posted, probably at Jobar. Note that the photo shows it facing the rear. Strangely, the guns have also been given single Shafrah plates. The sideskirts also appear to have gaps in them, probably to allow access to the Shilka’s regular exterior fixtures. Shilka Shafrah I, in Jobar, posted online on March 27th, 2017. The photo was probably taken on 26th March, 2017. The vehicle may have been built up to a week earlier, however, it seems odd that it has not been seen in combat earlier, if that is the case. Footage can be viewed here. Shilka Shafrah I, some time in March 2017, unknown location. 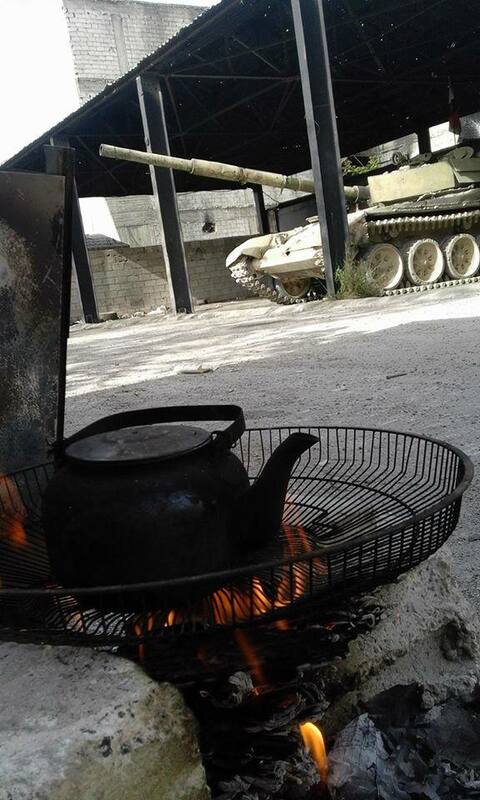 Probably somewhere in East Ghouta. Shilka Shafrah I at Jobar, 21st June, 2017. Eventually, the most of sideskirt on the left of Shilka Shafrah I was removed, probably because of a need to access the vehicle’s side ports, as can be seen in an unlocated photo dating to 12th October, 2017. It is also possible that it was simply lost due to poor driving. Shilka Shafrah I, 12th October, 2017. Unknown location. Note that the sideskirts have now been partly removed on at least one side (the other side seems to still have the sideskirt). 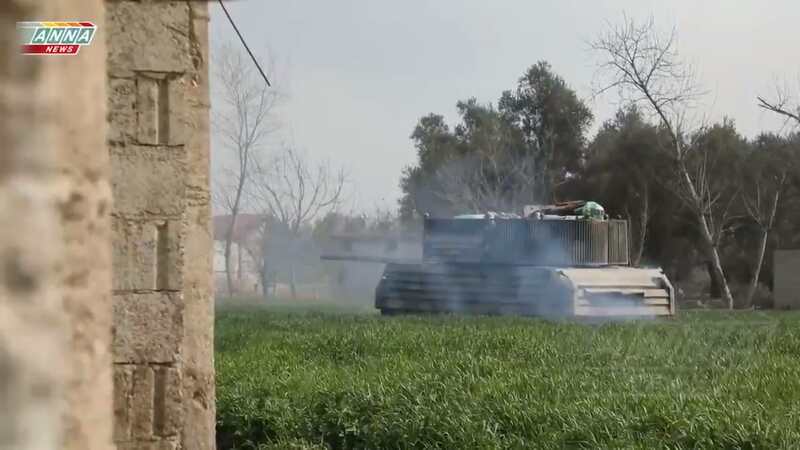 Shilka Shafrah I was also seen on 6th March 2018 at Beit Nayem, just two days after its liberation. It is unclear if it took part in fighting. Shilka Shafrah I after the capture of Mesraba, circa 10th or 11th March 2018. The left sideskirt is still on, but the right one has been removed (see above photos). 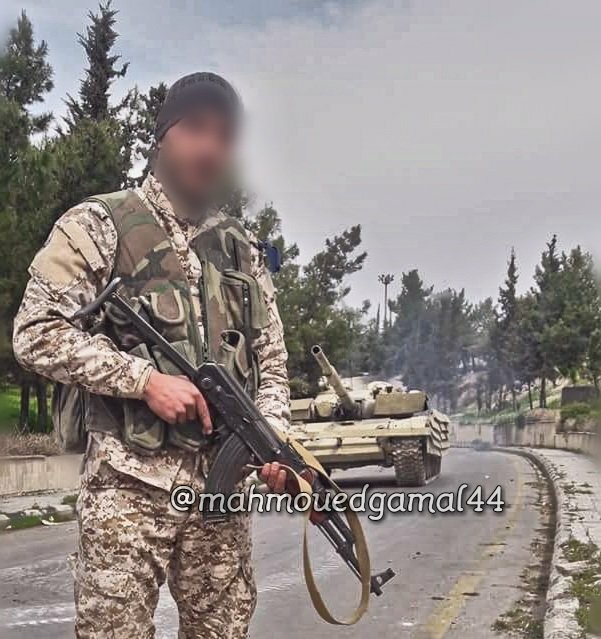 A new type of ZSU-23-4 Shafrah was seen in February 2018 (a fitting nickname may be ‘Shilka Super Shafrah’). This version is apparently a significant evolution to the design, with rows of vertical bars protecting the turret of the vehicle. The sideskirt is also apparently a single piece, and each welded plate is encased on the ends of the skirt, as opposed to them being roughly left open (see the turret for a contrast). The driver’s hatch also appears to be substantially up-armored. Most curiously of all is the rocket attached above the guns, likely for anti-urban infantry use, where the machine guns are not sufficient to penetrate buildings. Shilka Super Shafrah was also seen circa 7th March 2018 at the Eastern Ghouta Offensive. Shilka Super Shafrah, now with the frontal bar armor removed. Believed to be at Mesraba, circa 10th March 2018. Shilka Super Shafrah was videoed fighting alongside T-72s on the Mesraba axis on 11th March 2018. Shilka Super Shafrah fighting on the Mesraba axis, circa 11th March 2018. The Shafrah armor package originally appears to have been given to bulldozers, around October 2016. One was reportedly captured by Jaish al-Islam in October 2016. Bulldozer with Shafrah armor, captured by Jaish al-Islam in eastern Ghouta, October 2016. 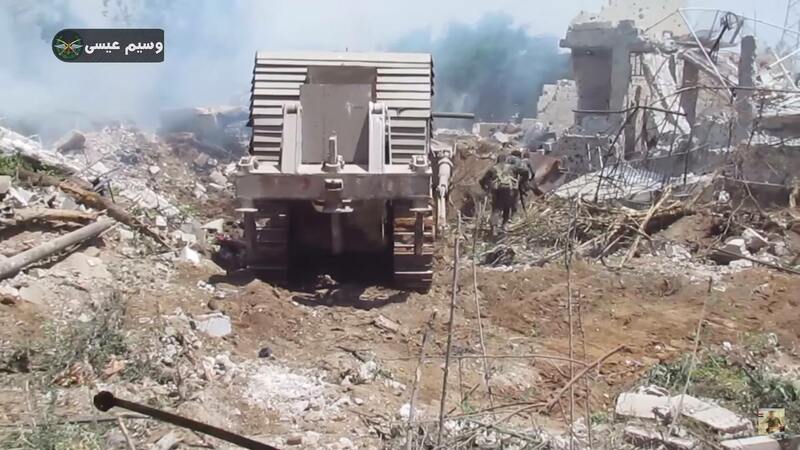 Other view of the bulldozer with Shafrah armor, captured by Jaish al-Islam in eastern Ghouta, October 2016. Another bulldozer with Shafrah armor was also used by the 105th Brigade at the Siege of Wadi Barada, January 2017. A bulldozer with Shafrah armor of the 105th Brigade at Wadi Barada, January, 2017. Another bulldozer, probably a third was seen on 30th March 2017, probably at Qaboun with the 105th Mechanized Brigade. A Republican Guard bulldozer with Shafrah armor. Posted online on 30th March, 2017. 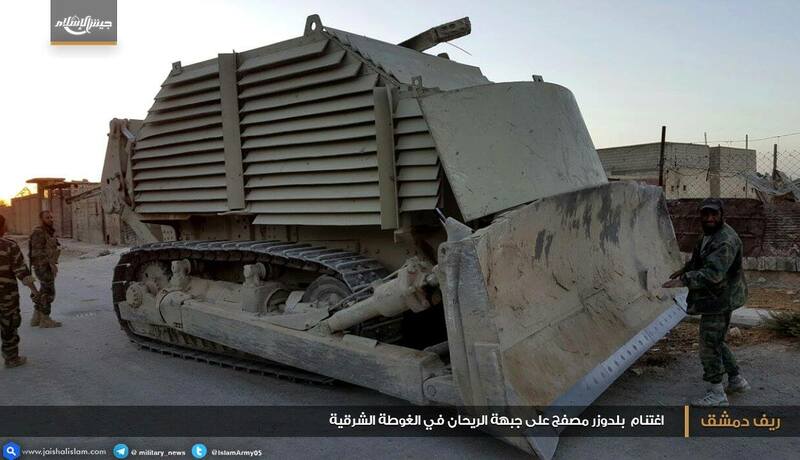 The most recent sighting of a Shafrah bulldozer is in November 2017. A video shows a Shafrah Bulldozer at the Jobar front being damaged (by IED or rocket is unclear, presumably the latter). 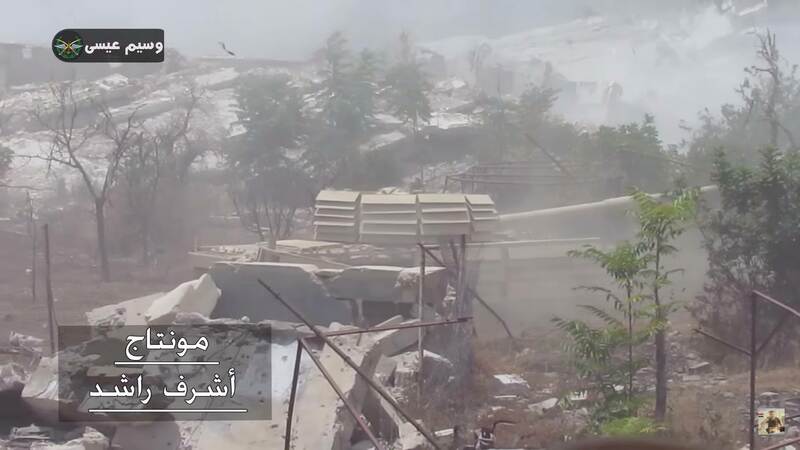 Still from footage of a Shafrah Bulldozer at the Jobar front, seconds before an explosion. 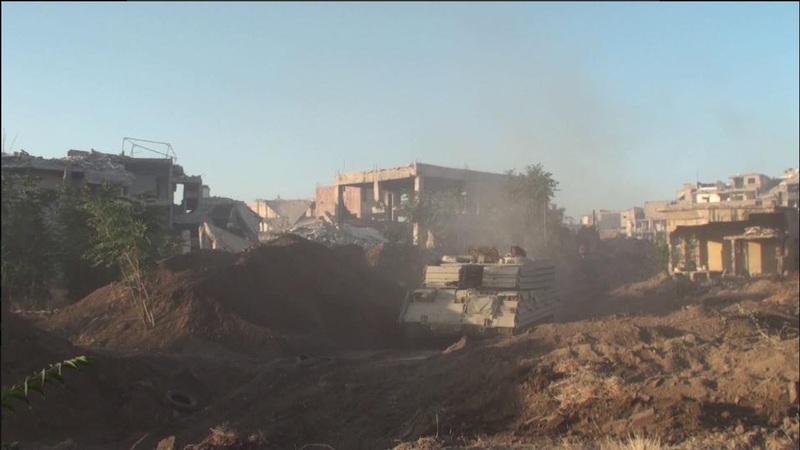 Still from SAA ‘archive footage‘ showing a Shafrah bulldozer in action alongside ground troops. Possibly at Jobar, late 2017. 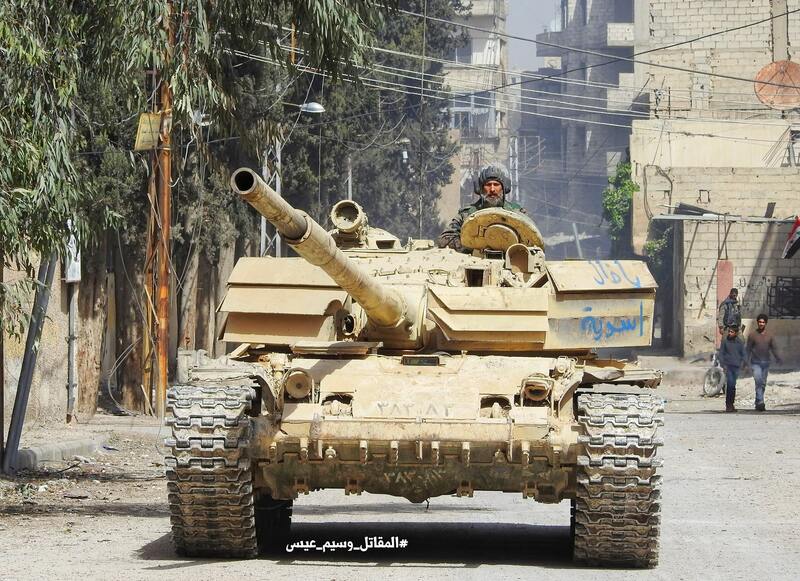 T-72AV Shafrah III is fitted with Viper-72 thermal imaging sights, and it is likely that others are, too. This can be seen on the turret, just behind the regular gunner’s optics. As a way around this, the SAA has fitted some of their tanks with Viper-72 thermal imaging sights, which do not require any infra-red lights. This is quite ingenious, as it allows not only effective aiming from 1.5 km – 2km (0.9-1.2 miles), but also the ability for the tank crew to see enemy snipers behind cover. Image showing the difference between a T-72AV with (right) and without (left) Viper 72 thermal sights. This armor, it’s so strange and odd looking. Was this armor designed for bouncing shells and machine gun bullets? 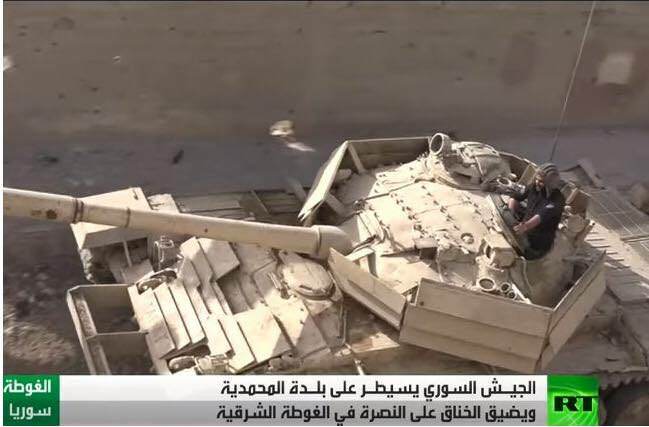 Also the photo with it being carried by the lorry, the T-72AV looks strangely like a M1A4 Abrams. But is this armor just made for spaced armor? T-72s are already impervious to small arms fire such as machine guns. They have already been able to make armour packages that are resistant to RPGs (See T-72 Mahmia, aka T-72 Adra). As for shells (from other tanks, field guns, etc), that’s actually a good question. 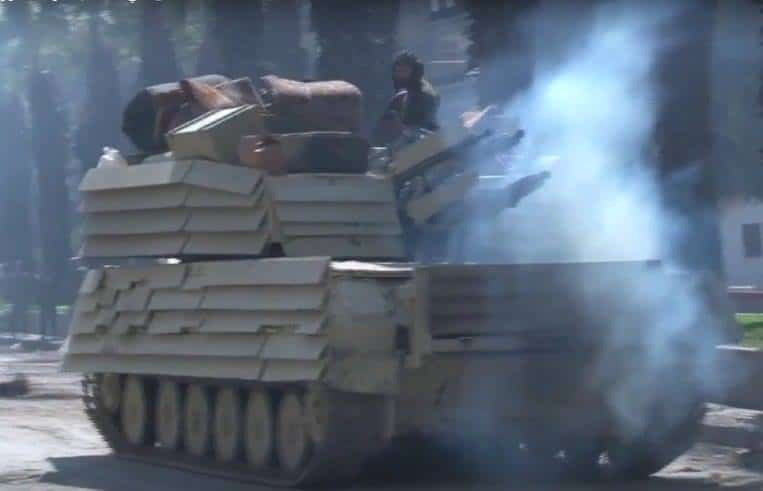 The Syrian Arab Army’s upgraded tanks (and i’m talking about armour packages; not cages which are more likely for ammo and equipment storage) only fight in Damascus, a heavily urbanised area. As a result, the rebels can’t really field any type of guns (the rebels in Damascus also don’t have tanks, to my knowledge), so resisting enemy shells is a non-issue. As I said in the article, the armour is specifically designed for defeating ATGMs (Anti-Tank Guided Missiles). Again, Damascus is heavily urbanised, so that means rebels with rockets can fire on SAA tanks from practically anywhere. Also consider that the T-72 cannot elevate its gun to hit every building, so the rebels have a strong advantage. However, the SAA are using ZSU-23-4 SPAAGs (which have a much better gun elevation) to hit rebels in high buildings, even then the tank is up close to the building. As a result, we’ve seen a handful of ZSU-23-4s with Mahmia armour and at least one with Shafrah armour. As I said in the article, the armour is not spaced, it is technically a composite armour. Even the T-72 Mahmia (aka Adra) is partly composite armour (the exact make up of which we’re not sure, but we’re told it’s cheap, basic, but highly effective).